With one of our exceptional low-profile trolley jacks, working on low-slung, sports and regular cars is now much easier and safer. Each option in our superb range of low entry car jacks is a fantastic addition to any personal or professional garage that demands the highest quality. Our low entry trolley jacks can confidently lift a wide selection of makes and models, thanks to maximum lifting capacities of between 1 and 3 tons. With a low-profile lifting range and a long reach, these trolley jacks make light work of lifting cars with even the lowest level clearance. Find the low profile trolley jack that fits your requirements. From kit cars to sports coupés and other types of car; repairs and inspections are an essential part of car maintenance. This can often include working underneath a car, but what if it has a low-slung body and sits low above the ground? Getting access can prove a difficult task. Our low entry trolley jacks can help. From ultra-low-profile trolley jacks to our professional pneumatic air service jack, our high-quality range meets the lifting requirements of home and commercial garages alike. Low-profile trolley jacks from SGS come with 360-degree rotating handles, wide lifting ranges and large steel wheels as standard. This guarantees the mobility and flexibility you need when working on a variety of different vehicles. 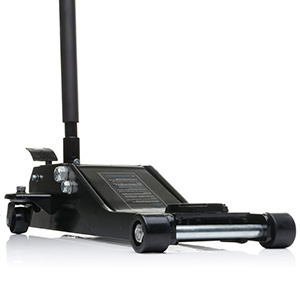 Need a case, jacking pad, axle stands or something more to go with your low trolley jack? We offer ready-made package options to help you get everything you need for your garage in just one place. Take a look at our range of products and discover the right ones for you today. For a brand-new low-level car jack or much-needed replacement for a current trolley jack, look no further than SGS. 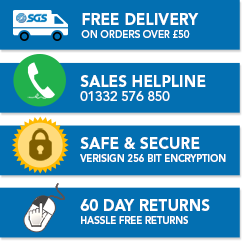 Order before 4pm weekdays and take advantage of our free Next Working Day Delivery service. You could be using your new equipment tomorrow! All products in the SGS low-profile trolley jack range come with a 2-year extended warranty as standard. For any questions you might have about which is the right jack for your garage, give us a call – our team of equipment experts are more than happy to help you make the right choice.